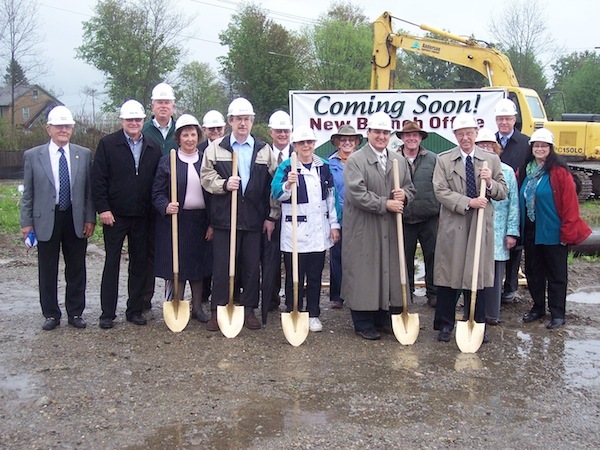 LITTLE VALLEY, NY – A groundbreaking ceremony was held on Wednesday, May 8, 2012, at the site of CCB’s (Cattaraugus County Bank) new office. Located at 517 Pine Street in South Dayton, NY, the new 2,300 sq. ft. building will provide customer access and service through three indoor teller stations and one ADA-compatible service window, a new accounts area, a manager’s office for private financial discussions, a conference room for meetings and loan closings, computer access for customers and of course, an employee kitchenette and restrooms. In addition, there will be a drive-thru lane, a drive-up ATM for express service, a night drop, convenient parking and a hitching post. This will be a full service branch with a full staff ready to handle and meet all of the financial needs of present and future customers. Construction is expected to be complete by mid-September this year. When construction is complete, a grand opening party will take place for all Cherry Creek and South Dayton friends and families. “Unifying our existing branches in Cherry Creek and South Dayton and building a state-of-the-art facility was an absolute necessity,” states CCB President & CEO Sal Marranca. “Those offices are in dire shape and in need of replacement. In 2012, our 110th year of business, we are pleased we can bring to the area an appealing, modern facility. And, this new facility comes with expanded hours of operation. I’m pleased to announce it will be open on Saturday mornings from 9am to 12pm. The dynamic of our strong, independent bank forms the foundation for our vision as a community bank that was born to serve our customers … a bank that was built to endure. We salute our faithful and loyal Cherry Creek and South Dayton customers as we grow in their communities and share this legacy”. PW Campbell, a family owned and operated planning, design coordination and construction management company based in Pittsburgh, Pennsylvania was chosen for the design and construction of the building. CCB is an FDIC insured, New York State chartered, independent, community bank. From January 2, 1902, CCB has established an unprecedented record of fiscal integrity and sound financial growth, which now totals over 190 million in assets. CCB maintains convenient ATMs and can be found on the web at www.ccblv.com. CCB is an equal housing lender. CCB’s main office is located in Little Valley, with eight branch offices. Happy Birthday CCB! 35 Years In Randolph!